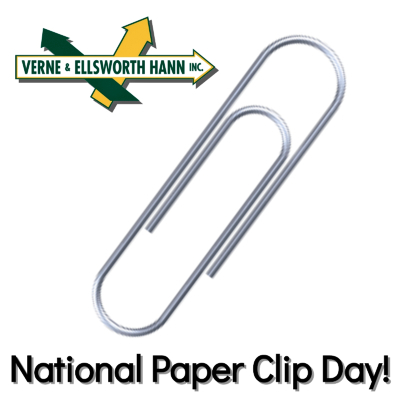 Today is National Paper Clip Day! Yes…even the paper clip has its own day! Did you know that the first patent for a paper clip was presented in 1867? The paper clip has many uses including unclogging a bottle, a substitute for a jewelry clasp or even removing the pit from a cherry! Here at Verne & Ellsworth Hann, we use a lot of paper clips every day. I couldn’t imagine life without this important paper holding device! Verne & Ellsworth Hann is the ONLY Hann family owned heating, cooling and plumbing company in Cleveland. Owned and operated by brothers, Bill and Chris Hann, Verne & Ellsworth Hann has 5 generations of Hann family experience. Today is the day to celebrate the paper clip and its many uses. Just remember though, if you ever need service on your heating or cooling systems or on a plumbing issue, call the professionals at Verne & Ellsworth Hann at 216-932-9755. DO NOT use a paper clip to try to make the repairs yourself!